Show of hands: Ever try to cut a pill with a knife? Oy…OMT! has the stomach squinches when you do stuff like that. I bet ERs love you! CONFESSION TIME: I’ve done it too. There’s a better way, my babies – try using a pill cutter. You know, that thingy that’s made for cutting pills safely. Typically, if we need meds, we get the doc to prescribe in the exact dose, so there is no need for splitting pills. The hunt was on, and I settled on this one, while crossing my fingers that it would work. SPOILER ALERT: It handled the job just fine. ~ Made from Optical grade polycarbonate with a flexible V-shape holder to grip any size pill for accurate cutting. The contoured design has an overmold for comfort. Includes retracting blade guard for added safety. ~ The Apex Ultra Pill Splitter utilizes a unique V-shaped design to firmly grip pills of any size for easy, accurate cutting, making this a premium medication splitting device. It’s the best option for providing accurate dosage of any medication tablets. ~ The ergonomic design of the Apex Ultra Pill Splitter, crafted with an overmold with added finger grooves, makes it comfortable to split pills in half for accurate dosage or for those who have trouble swallowing. Sure to be your favorite healthcare product. ~ The Apex Ultra Pill Splitter has a retracting blade guard to create a safe cutting environment. The blade guard covers the blade when the pill splitter is not in use, so your fingers are safe, and your blade stays sharp for cutting pills with just a push. ~ Compass Health Brands has been a leading manufacturer of Respiratory, Pain Management and Home Medical Equipment for over 20 years with one goal: to provide innovative, high quality products that enable consumers to live healthier, more independent lives. ~ Apex Carex Ultra Pill Splitter With Blade GuardIt can be used to cut medication doses in half or is useful for those who have difficulty swallowing pills. ~ Cut large pills in half safely with this Apex Pill Splitter. Designed for convenience, this pill slicer allows you to cut pills in half and collect them in a built-in tray — making it simple to divide a day or a week’s worth of pills in one sitting. ~ Featuring a pill grip, the Ultra Pill Splitter holds the pill firmly in place while cutting. 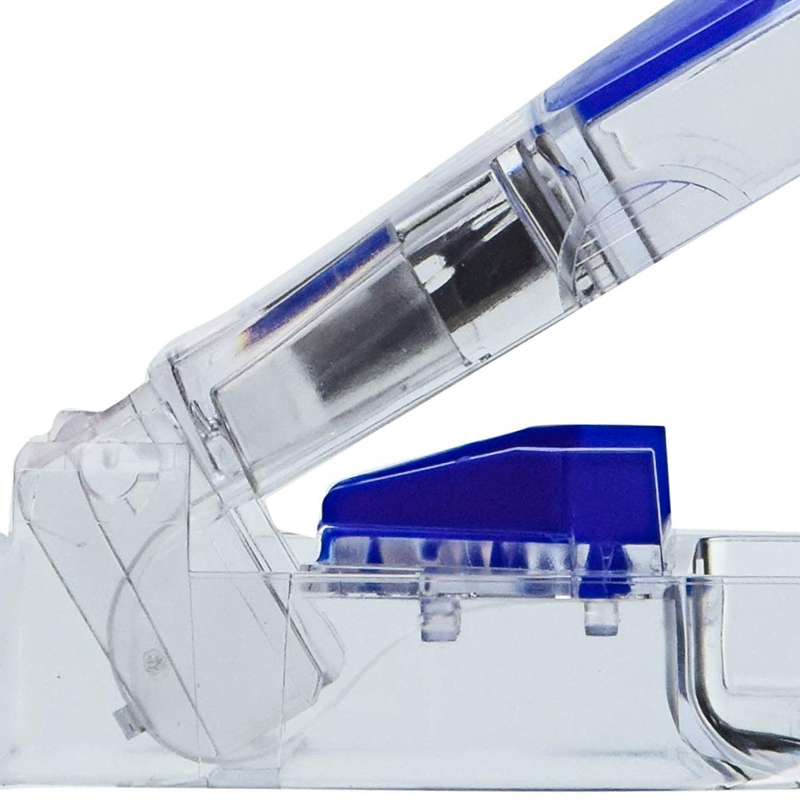 This clear Ultra Splitter features opaque blue grips for easy handling and a self-retracting blade guard for safety. ~ Split pills cleanly in half with the strong stainless steel blade of this convenient Pill Splitter. The Measure of Excellence in Self Care. Contoured Design for Comfort and Security While Splitting. New Self-Retracting Blade Guard for Added Safety. Pill Grip Holds Pills Securely. – Designed for your convenience. – Ergonomic overmold design includes finger grooves for a comfortable grip. – Self-retracting blade guard for ease of use. – Pill grip holds pills securely, allowing you to cut pills safely in place. – Clear with opaque blue grips. – Strong stainless-steel blade contributes to a lasting ultra splitter. ~ It worked great on an odd-shaped pill. ~ It didn’t take tons of futzing to line the pill up into the proper position. ~ The rubberized side gripped the pill, and held it in place, better that the plastic pill splitters. ~ The blade retracts, so no accidental cuts. ~ On the first try it broke the pill in an uneven fashion. I almost gave up, then decided a bit of user error may have played into the hot mess. Once I tried again, it worked fine. ~ It only cuts one pill at a time. Overall, this cutter works for us because it’s not often we have pills to cut. My favorite part is the rubberized material holding the pill, cause no one has time to chase down pills that escape from the pill cutter – trying to find them before the dog, or worse – kiddo, does. My second fav part is the retractable blade. Do you use a pill cutter? Or is it the ol’ kitchen knife for you? I use a pill-cutter, but it’s plastic and the pills do slide around. The rubberized gripper sounds like an excellent idea. Thanks for the tip! That tiny piece of rubber makes all the difference!